Gaston and I have had further, positive revelations on the question of la nourriture: French public markets. Les marchés are nothing like Granville Island’s sanitized vegetable warehouse outlet. Here, local or at least regional producers selling their specialties of the season predominate. 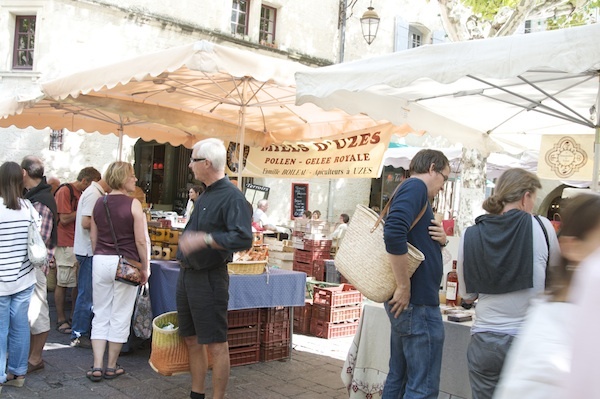 Then we encountered the Monday market at Mirepoix: enough vendors and purveyors to keep it interesting and varied; not so crazy you have to keep your hand on your wallet. That’s when Gaston and I discovered that would never survive as trout in a fishing stream: give us a nibble and you’ve hooked us. Some stinky goat cheese made high in the Pyrenees: hmm, yum—nous voudrions 250 milligrams, svp. Oh, you must try the same thing made with cow’s milk—much milder. D’accord, some of that, too. 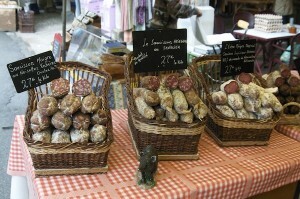 Some saucisson made with herbes de provence? Oh, also try this, avec cèpes (a mushroom), and oh, this, avec tomates secs: and before you know it, we’re proud parents of a lumpy ring that looks uncomfortably like a third of a metre of stuffed intestine. Mm-mmm. And that’s the one we bring home. 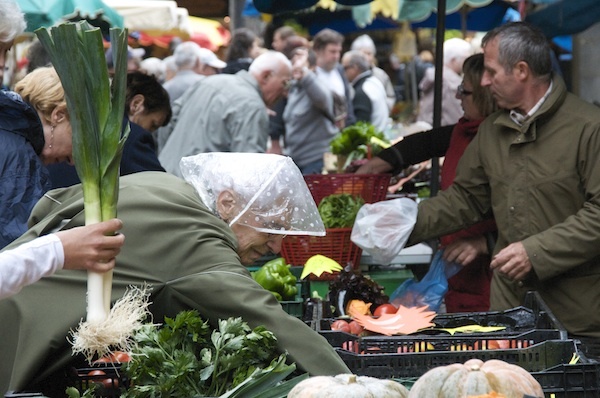 Today, with me translating between him and the vender at the market in Bessans, Gaston bought some green olives in fresh minced and whole garlic, some new kalamatas, and a couple of big fistfuls of green olives pickled with pimentos. This was after he sampled all of the eight varieties on offer, so obviously he was exercising restraint. The nice thing about mid-size markets (50–100 vendors) is that it’s big enough to have all the good stuff from miles around, but neither are you so busy keeping track of each other that you miss the local characters. Now we’re on our way to becoming market junkies. When we come into a strange village/town on market day, with no idea where to find the goods, now we know to look for and follow the people with empty baskets and to go against the flow through the streets of people with full baskets. 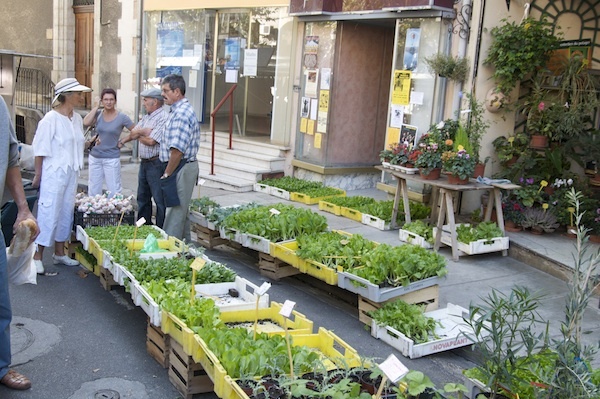 It’s a sure way to find market-central anywhere. It’s just possible that if you planned your week around visiting the larger food markets in a region, you could just maybe get away without buying any groceries for the week. But what’s the fun in that? Besides, how could you possibly pass up bringing home enough seductively-scented paella, scooped fresh from the cooking pot, for lunch? Or maybe you should have the couscous with sauce instead? Or the bouillabaisse, loaded with fresh seafood from Perpignan. And then, for supper, the roast farm chicken, with roasted potatoes and green peppers, with a nice green salad on the side for your own sausage-making mechanism.